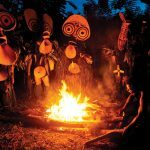 The National Mask Festival & Warwagira promotes the unique mask cultures of East New Britain Province. The Festival is an extravaganza of cultural dancing, ritual performance, story-telling and exchange – with a variety of arts and crafts on display. The 2019 National Mask Festival & Warwagira will mark the 25th anniversary of the event and takes place from July 10th to 12th, in Kokopo at the Ralum showground.